Most of the development in Tredworth took place from the middle of the C19, initially largely semi-detached villas such as those on Brook Street, most notably number 22! Immediately next to the Golden Heart is a tollhouse for collecting tolls along the turnpike road there from the C18. In the 1880s development had taken place to the east of the High Street but the west side was mostly still open land known as Newtown. In this area, huts inhabited by the poor who had been evicted from High Orchard sprang up around a pipe factory in the 1830s. Melbourne Street and area became known as California and was described in 1871 as ‘a strange mixture of neat villas, fragrant pigsties, and Newtown shanties’. The Newtown huts were removed by 1891. Tredworth School opened in 1887 and was designed by A. W. Medland, who also designed St. Paul’s primary school (or St. Luke’s as it was known then). In 1904 there were 770 pupils on the roll. The infant department moved to Victory Road in 1970. In 1876 Wesleyan Methodists moved back to Newtown and opened a mission room in Tredworth Road that was used until 1883. It is at about number 41 Tredworth Road. The crossing house at the junction with Stroud Road was in use until the Tuffley Loop was dismantled in 1975. Until that time trains regularly ran along the backs of the houses between Parkend Road and Furlong Road. Farm Mews is the site of an old farm. In 1850 a building near Old Farm on Barton Lane (later Parkend Road), formerly known as Parkers Row and two cottages were built as part of an allotment scheme. In 1914 Gloucester’s first purpose-built cinema was opened in Parkend Road, the Empire, or the Parkend Empire as it was known. It had 350 seats and survived until April 27th 1957, when it was sold to the Elim Pentecostal Church, who still own it today. There was a population of Ukrainians in Gloucester after World War II. They took over the church on Derby Road that had originally been built for and used by the Church of the Good Shepherd built in 1892. It was bought by a community of Ukrainian Catholics in 1974. The Ukrainian Club Dnipro in Midland Road was opened in 1963, each family pledging money towards the building, and since then it has been a focus for Gloucester Ukrainians, though it welcomes everybody to its bar, skittle alley and function room. Early to mid Victorian villas are still visible in Brook Street. Tredworth was a fashionable place to live at that time. The Chapel and School marked on the 1880 Ordnance Survey map was probably the site of the Wesleyan reformers school and chapel. In 1870 the Ryecroft Street chapel became too small so a larger one was built on the corner of Falkner Street. In 1876 a house on Falkner Street was bought for the minister. The Chapel closed and the congregation moved to St. Luke’s on Stroud Road. The Falkner Street site was then used as an annexe to Gloucester College. Barton and Tredworth Community Trust took over the running of the site in May 1999. Victoria Street was one of the first developments in Tredworth. 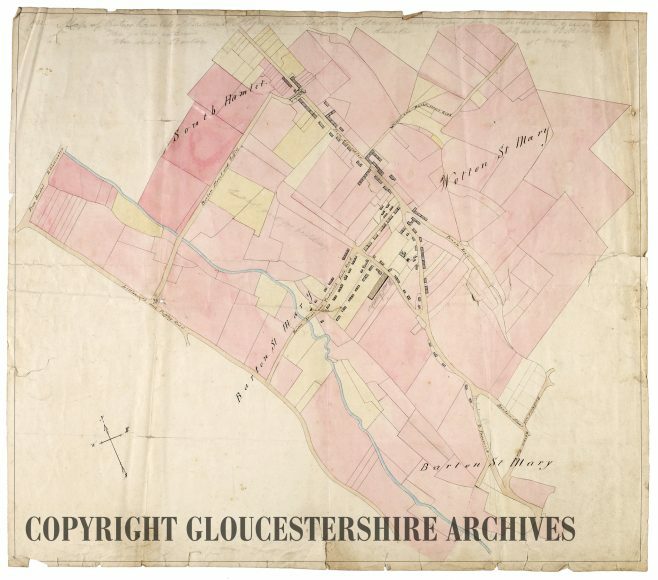 It was laid out by Richard Helps in 1837 and appears on Causton’s City map of 1843. Ryecroft Street was begun in 1843 so is another early street in Tredworth. There has been a Muslim community in Gloucester since the 1950s. Two houses in Ryecroft Street were registered for use as a prayer hall in 1968. In 1981 these houses were demolished and a larger mosque built, designed by local architect Brian Tait. The new mosque opened in 1983. In 1871 the Wesleyan school on Victoria Street moved to Ryecroft Street. In 1904 there were 410 pupils but it had closed by 1908. The dyeworks recorded in Ryecroft Street on City maps of 1925 and 1938 is now No.101 Ryecroft Street. St. James’ school opened in 1844 and cost £2345, the government gave £565, the National Society gave £400 and the rest was raised locally. It had a girls, boys and infants department and was built to school 486 children. In 1984 there were 103 pupils on the roll. In 1876 a school board was formed to sort out the shortage of schools in the Barton Street area. Widden School opened in 1878. Built to school 660 children, in 1904 there were 778 pupils on the roll. In 1887 Tredworth School opened. In 1904 there were 770 pupils on the roll. The infants department moved to Victory Road in 1970. Hatherley School opened in 1901. Built to school 890 pupils, in 1904 there were 803 on the roll, in 1915 there were 1028, in 1938 there were 724, and by 1984 just 92 pupils were in attendance. A voluntary school called Alington was opened on Millbrook Street in 1869 but was closed again by 1878. Cottages on Mop Lane (later Upton Street) were recorded in 1799. St James Church was begun in 1837 and consecrated in 1841. It was built by subscription. The house for the curate was built in Upton Street in 1854 and was demolished in the 1980s when a new vicarage and other houses were built on the site. The church, designed in a late C13 style, was a single cell building with a north gallery, porch and bell cot. A chancel with east vestry and an east aisle with a wooden bay were added in 1879. In 1979 the Gallery was enlarged and rooms created underneath. The City Farm was opened in the early months of 1998. To begin with there were a few rare breeds of sheep, pigs, goats and poultry. There were also some smaller animals like rabbits and guinea-pigs and, by 2003, the farm had a herd of 20+ cattle, a mixture of rare breeds such as Irish Moiled, White Park, Highland, Longhorn and the local breed of Gloucester cattle. In 1835 the local sewers and drainage didn’t meet the rapid growth of housing so health boards were set up but didn’t have much effect. In 1876 new sewers were laid, but it took until 1885 to get all the houses connected up. Albany Street was formerly known as Back Barton Terrace. In 1813 seven Baptists were worshipping in a room in New Inn Lane. They began a mission to Barton End and by 1824 there was a congregation of over 200. In 1823 the Baptist minister built a small school-chapel in Back Barton Terrace. In 1840 the school replaced by a new room in Barton Terrace (later the north part of Tredworth High Street). In the 1820s the building at the junction by India House inn was owned by Thomas Smith, a timber merchant and he began the development of Barton Terrace, later the High Street. A Corn merchant Joseph Sturge built houses for his workers on Falkner Street in 1850. Development continued on Barton Terrace (later Tredworth High Street).